UNITED NATIONS -- The U.N.'s World Food Program (WFP) has gone tech-savvy. Drones, the organization said at the U.N. this week, are key to a more advanced fight against hunger and to help humanitarian aid and data collection in places like Cox's Bazar district in Bangladesh, which has dealt with an influx of Rohingya refugees from neighboring Myanmar. Enrica Porcari, head of WFP's Technology Division told CBS News that the use of drones in humanitarian responses is groundbreaking because "it could reduce humanitarian response time from days to hours to even minutes and make delivery of assistance more efficient, accurate and cost-effective." "Drones can allow humanitarian agencies to mitigate risks before they turn to disasters," Porcari said. 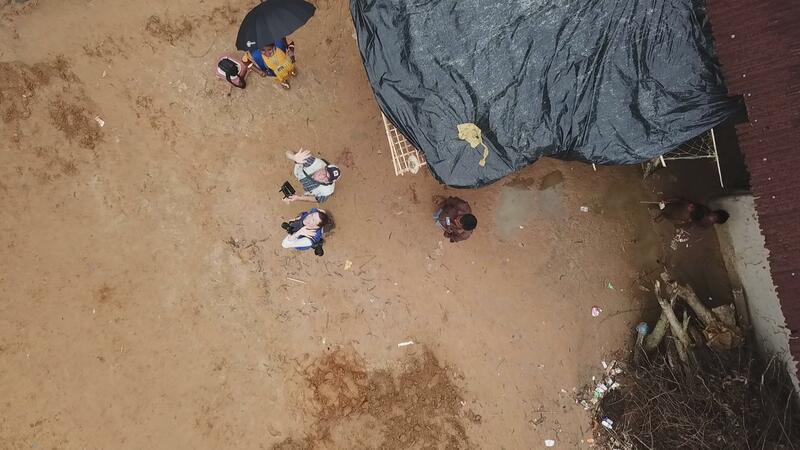 The example she gave was Mozambique, where the WFP-supplied drones were able to send data to analyze flood-prone areas and allowed the government's disaster management agency to move people in areas that will be affected by the floods before it actually reached them, greatly reducing potential loss of life. Of course, with any technology, there are challenges, Porcari said at the U.N. panel to present the project to the public, in a meeting sponsored by the Permanent Missions of Belgium and Mozambique. The idea of drone use in humanitarian assistance has broad support at the U.N. At the discussion on Thursday was the WFP, along with the International Committee of the Red Cross (ICRC), UNICEF, and United Kingdom's Department for International Development (DFID). The meeting took place as Belgium announced that they would contribute $2.5 million – a small but important start -- to WFP for drone and blockchain project development, Steve Taravella, senior spokesperson for WFP at the U.N., told CBS News. Rehan Asad, chief of staff of WFP talked about his personal experience. His young daughters play with their own drones at home and he told the story, he said, because he wanted to emphasize that drones can be considered a fun new gadget, but that the humanitarian community must make clear that this is about humanity and dignity of people in need of help. Many of the speakers emphasized the challenges. Porcari told CBS News that the principal one is: "Community acceptance, as some people still associate drones with military applications." Others said that proper training was vital, to avoid damage to people or property on the ground. But for now, the project, as they say in the drone world, has taken off.